Avedisova lists 6 ionising stars for the Tulip nebula, including the ultrahot O4 I multiple supergiant HD 190429, the O6.5 III giant HD 227018, and the O9.7 I multiple supergiant HD 226868. Humphreys places HD 227018 in the Cyg OB3 association. As you can see from this false colour hydrogen-alpha image, the Tulip nebula is located at the edge of the Cyg OB3 association. The HD 226868 star system is best known because it includes the powerful X-ray source and suspected black hole Cyg X-1. 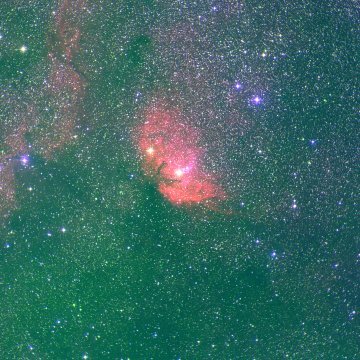 Available distance estimates place the Tulip nebula and Cyg OB3 in the Orion spur, some distance behind the Cygnus X star formation region. You can see the setting for the Tulip nebula in this amazing wide angle image. This MSX image reveals that the Tulip nebula is just a small portion of a much larger nebula visible in infrared.